San Jose Mercury News staff photographer Nhat V. Meyer just completed covering his first Olympic Games in Athens, Greece. 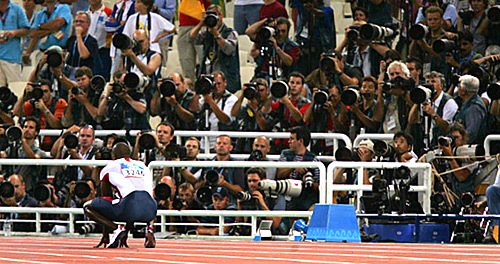 USA's Shawn Crawford kneels on the track after winning the Men's 200 Meter Dash at the Olympic Stadium for the 2004 Olympic Games on Thursday, August 26, 2004. 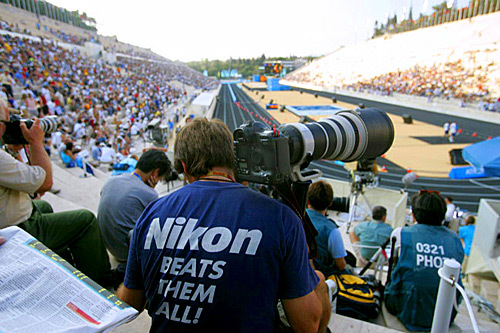 Editors note: SportsShooter.com member and San Jose Mercury News staff photographer Nhat V. Meyer is in Athens, Greece covering his first Olympic Games for KRT (Knight Ridder Tribune) and the Mercury News. KRT is a wire service - there are seven others there from KRT papers: The Charlotte Observer, St. Paul Pioneer Press, Kansas City Star, Miami Herald, Philadelphia Enquirer, Contra Costa Times, and the Detroit Free Press. Following are some excerpts from his blog that he is updating daily for family and friends about his experiences in Athens. "It's like sitting down to an exquisite dinner and only having five minutes to eat everything." Great freaking quote by Joe Rossi from St. Paul Pioneer Press that really sums up the Olympic experience as we were chatting in the photo moat at the finish-line before the track and field events tonight. There are just so many different events, so many different venues, so many great pictures to be made here that one individual can only scratch the surface and hope to get some of the gravy. Rossi is a great guy, as are all the people in the KRT team. He's a really tall (well most everyone is taller than me), gentle spoken dude with a more salt than pepper beard, who offers great insight and suggestions. This past week has been great because we've double teamed, sometimes triple teamed some of the events that we are doing. It's really interesting to hear the veterans of the Olympics say how this one compares to past ones. I've really gleaned something from everyone I've worked with here and I hope to apply that knowledge towards my every day workflow. How they deal with different situations and how they prepare for certain events. When to acquiesce and when to stay firm. The list goes on and on. And on the other side of the coin: the nasty side of the Olympic games (for photographers) has reared it's ugly head. Things are starting to go missing. One photographer had a Canon 1d with a 16-35mm lens stolen at the gymnastics venue. Another had a remote camera with a 300mm lens stolen off the G platform at track and field (it's the large white platform at the finish-line). And that's all that I know of. I'm glad that I got (and the company paid for) all the PacSafe products I have here - I'm going to be much more diligent in locking my gear up the next couple of days. At many of the venues there are lockers designated for photographers - these are only good if you are going to be going to the same event on a daily basis. Not good for us as we don't know what we are doing until the day before. But I hear that at Sydney in the final days of the Olympics at one venue all the lockers were broken into and gear was stolen. 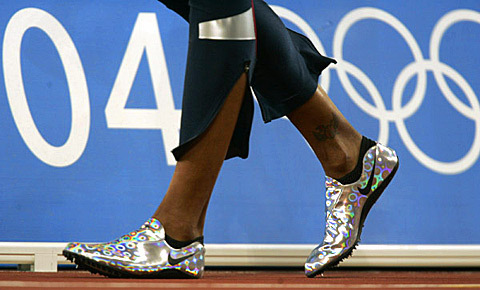 USA's Marion Jones walks on the track before competing in the Women's 400 x 100 Meter Relay at the Olympic Stadium for the 2004 Olympic Games on Thursday, August 26, 2004. There was also an unconfirmed incident - from a very reliable source - that a photographer went off and tried to punch a photo manager! I have no idea who either of these people were but I heard the photo manager was the one to connect. Well the photo gods must have heard me ranting and raving about pool vests because they blessed me with one this evening! Well actually a really nice, smiling, smoking, large Australian dude did. Apparently they have two or three rotating pool vests which are supposed to be requested 24 hours in advance - the rest are assigned. The person before me was only allowed to use it for 30 minutes. Our picture editors requested a pool vest - so we got it for about one hour. I photographed the qualifying jumps for the Women's High Jump. I was looking specifically for three Women. It was tough because one was in group A and two were in group B. Each group contained about 20 jumpers The thing about the high jump is that there doesn't really seem to be an order that they jump. If one person makes a certain height then they are done until the bar is raised. If another person doesn't make the jump they get three attempts. So it seems like they are jumping wily-nilly. The pictures I got were nothing special - but there is no other way I could have gotten them without the pool vest. It was cool to go out on the field though - might be the only time I ever get to do that this trip - well I'm confident in saying that it will be the only time I'll do that this trip. I must not be working hard enough these days because I've become somewhat of a glutton for punishment. After my assignment tonight, which I'll get to in a second, I had to catch three buses back to Selete from the swimming venue - about 45 minutes to an hour. But you know what it's a 10-15 minute walk and I'm getting sick and tired of these damn buses. So I took one bus to the Irini metro station - from there you typically take a second bus to the MPC and from there the third bus to Selete. But I guess I felt like I didn't work hard enough today because I thought to myself - damn these buses I'm going to walk with all my crap including remote stuff (which easily adds an extra 10 pounds to my already heavy bag). Was it worth it? Well I did save 30 minutes out of my life. But what I forgot about is that from the Irini metro station the walk is all up hill (after three flights of stairs to get out of the station itself) - and the last part is relatively steep - not steep when you're walking without stuff, but when you've got gear - it is very steep. USA synchronized swim team enters the pool to start their routine for the Synchronized Swimming Team Event - free routine at the Olympic Aquatic Centre for the 2004 Olympic Games on Friday, August 27, 2004. USA won a bronze medal. The brain children who run the buses finally realized (just today) that the buses that they are using which go around the Olympic Stadium complex are too small. They're like oversized mini-vans. We're packed in there like sardines in a can and you have to push your way in and push your way out... which is really great when you have a 24+ kg case. So today was the first day, at least that I saw, that they brought out a decent sized bus, big enough that I could stand there without someone's sweaty pit in my face holding on to the handlebar. 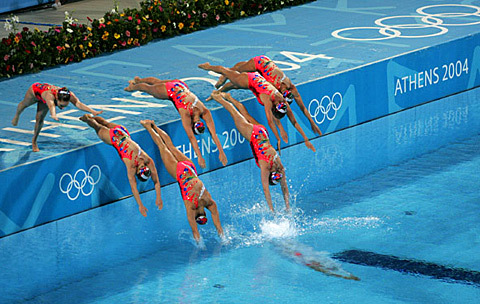 The synchronized swim team competition was tonight at the Olympic Aquatic Centre. I think only one of the nine is not from the Bay Area. Syncho is nice because it is short - each routine is about 3-4 minutes. Tonight eight teams competed followed by the medal ceremony. All in all it took no more than an hour and half. The Russian's won, Japanese second and the American's won bronze. I talked about it in a blog a couple of days ago - how theatrical it is - I mean they are really athletic but when they start out the routine they have to walk out on a platform and performs these weird herky-jerky movements, I guess they are basically the same movements they do in the water but it just looks weird. Photographically it's like, pardon the pun, shooting fish in a barrel. Even though I've only photographed it a couple of times it's easy to tell when they're about to do a lift, that's when they go underwater and push one or two people up above the water and they do flips or something - there's just a really long pause because they have to all swim underwater to prepare for it. There was an underwater viewing area but because the routines are so short you have to chose to either photograph underwater or above water - the underwater area is really only good for two or three pictures while above water is good for multiple pictures. If we had had two people there tonight then it definitely would have been worth going to the underwater window. But since it was just me it wasn't worth it. Spent the afternoon getting organized, throwing some stuff out - recycling other stuff, trying to catch up on work and personal email and copying stuff to my external hard-drive. I have an 80 gig hard-drive that I've been transferring all my assignments to - the good thing is that it's small and light - as opposed to carrying 30-40 blank cd's - bad thing is that I'm going to have to burn all those cd's when I get back to work. It was baking today so I was happy to be indoors most of the day. I got to the venue early so that I could set up a remote and I wandered the Olympic Stadium Complex. One tip on souvenirs, if you see something you like it's probably a good idea to buy it right then. I know you hear of the people who wait until the last day or even after the Olympics are over and they go out and they try and find the 25-50% off stuff. First of all I don't have time for that. Second of all I'm glad I didn't do that because they are running out of stuff. At the Olympic Stadium Complex they have one huge tent with a bunch of stuff in there - but I'd say a good 25% of the stuff that was there the first couple of days are no longer there now. Like coffee mugs - if you know me I'm a coffee mug collector - if I hadn't bought a coffee mug right away I'd be bumming cause they're all gone. I'm sure there are still some left in the stores in the Plaka, but I don't know if I'll have time to make my way down there again. The Olympics kinda remind me of summer camp. When we were kids my brother and I used to go to summer camp in Ann Arbor - we had to bus there, just like here. We had camp counselors telling us where to go and when to go there, just like the photo team members. The food sucked (actually I think the camp food was better - at least they had sloppy joes - the food in Greece is good - the food at the venues which is what I have to eat a lot of the time is horrible). The weather was hot and sticky. Didn't really know anyone at either place and I missed home. But after I left I kinda missed it, we made friends as time went on and actually enjoyed our time there. I think I'll have fond memories of my Olympic experience. It has been a great experience and I've learned a ton and made new friends to boot. You have an automatic connection with with the people you work with and people from other papers because we all know what each of us is going through, we can all empathize with each other. Mark Purdy, our columnist from the Mercury News, told me that this is "the best/worst assignment I do." I couldn't agree more. All of the sudden this last week is over - one more day... can't believe how fast it went by. I'm more excited to go home than I was to come here! I figured out why there are a lot of grumpy Greeks. They don't have a good candy selection. No Skittles or Jolly Ranchers nary a Reese Peanut Butter Cup to be found. I bought a Cadbury Crunchie today - really weird candy - "milk chocolate with golden honeycomb centre" - reminds me of when you got weird candy you've never heard of for Halloween and it pretty much never tasted good - well same concept here. Where are the Whatchamachallit's? Who wouldn't be happier if they ate a Kit Kat or a gummie cola once a day? I also bought a Glucose candy bar! Eat it if you dare! By the way - if anyone knows where to purchase a Tootsie Pop Drop please let me know - that's my favorite candy which was discontinued and I hold out hope beyond hope that they will reintroduce it one day. 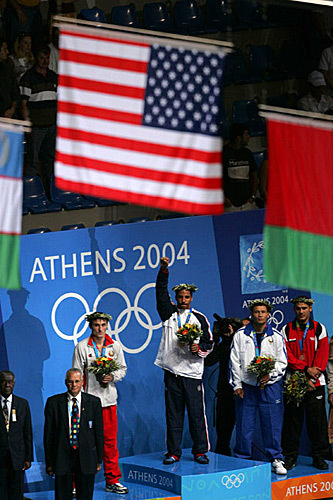 USA's Stephen Abas, left, wrestles Russia's Mavlet Batirov for the 55 kg gold medal match at the Ano Liossia Olympic Hall for the 2004 Olympic Games on Saturday, August 28, 2004. Batirov won the gold, Abas the silver. Covered the gold medal football game this afternoon, that's soccer to you American blokes. I had thought it was a relatively decent game for a gold medal match - heck how was I to know - this is the first real international game I had covered - I have covered some exhibition games and San Jose Earthquakes games in the past. But when I got back to the photo workroom I found out that it apparently wasn't a good game at all, the adjectives blurted forth were: horrible, crap, boring, etc... Covering Euro Football must be great fun. Photographically the backgrounds sucked big time - it was at the Olympic Stadium but the stadium was pretty much empty so the background consisted of bright white seats. I guess I can be proud to have been at the most boring soccer game ever. The score was 1-0, Argentina beat Paraguay. I had the evening off, but I definitely wasn't going to sit in my room tonight, there were so many events going on I had a hard time deciding what to go to; TaeKwonDo, volleyball, handball, basketball, boxing, diving and track & field. A potpourri of sports to chose from! But I got this mass email from the USOC saying that we had three American's in gold medal matches tonight at the wrestling venue. I thought hey that sounds good! Patrick Schneider had been there all day (since 9 am) so I thought I'd go check things out. I called him and got the low down and then headed over there. Well the American's didn't do so well, nothing's wrong with a silver medal - that's awesome - but news-wise it turned out to be a fizzle of a story. If we had won three gold medals tonight it would have been the story of the day - instead only one won the gold. It was still cool to be there. You know when I'm at venues photographing stuff I sometimes lose site of where I am - I know where I am - I'm talking about the overall view - a sports venue is a sports venue is a sports venue. It's not like I'm at the Acropolis every day or have some great Greek ruin in the background. Once you get inside the venue you focus in on the sport going on and lose site of where you are. So every once in a while I like to put the camera down and just watch and listen. I watch the action and the crowd, the coaches, the judges, just look around and see what is going on, just take in my surroundings. I obviously don't do that when a US team is competing, but when Russia is going against Korea I can afford to take a break. Every couple of days the cleaning staff leaves us some sort of gift - like nice, swanky shampoo, but a couple of times they've left us hard liqueur. Today I got back to my room and found a bottle of Ouzo. I guess we media types are boozers. Started out the Olympics at opening ceremony at the new Olympic Stadium, my last assignment was at Panathinaiko Stadium, the old stadium where the Olympics were reborn in 1896. But first things first, I went to the wrestling semifinals at 9:30 a.m. Caught the 8 a.m. shuttle out of there and two buses later I was in the venue by 8:30. I shot a bunch of qualification matches and then semifinals matches. There was a pretty decent crowd for those matches. I shot the first four up in the stands and then went down to mat level for the rest. That went until about noon. I went sans my rolling case, I had no time for remotes today because I had a busy day planned and I'm damn tired of dealing with bus drivers and carrying that stupid case. Yes it's a rolling duffle, but apparently they don't have any handicap laws like they do in the U.S. Not sure how the Paraolympians are going to get around because a lot the venues had stairs, stairs everywhere. It's almost like they enjoy stairs, they're definitely stairhappy here. USA's Andre Ward celebrates his Light Heavy 81 kg gold medal win against Belaruse's Magomed Aripgadjiev at the Peristeri Olympic Boxing Hall for the 2004 Olympic Games on Sunday, August 29, 2004. Now that I'm a veteran (haha), well at the very least I kinda know what I'm doing now, wait maybe that's pushing it, I just knew what gear I needed for today so I knew that I could go light - with just two bodies, a 400mm f2.8, a monopod, a 70-200mm f2.8 and a 16-35mm f2.8 - and that's it - well plus two extra batteries and a 1.4x and a 2x converter, no more - oh yeah and my computer and cords and stuff - and that's it, that's as "light" as I can go. I did get a chuckle in the morning because one of the announcers had the same exact nasally voice as Will Ferrell. "And now wrestling on the B mat..." I enjoyed covering freestyle wrestling - or at least I liked covering it there. The light was good and the action was pretty good too. The lighter weights were a bit more fun because they seemed more likely to throw their opponent around. I brought my computer out on the floor with me and downloaded disks to save time. Then straight to the boxing venue after wrestling in order to make the gold medal round with Oakland's Andre Ward. I found out that somehow Branco, the photo manager mentioned in 08/16/04 blog, found out that some of the excerpts from this blog were posted on sportsshooter.com (maybe he's a member - I'll have to go check) and he came up to me and thanked me for mentioning him! He said it was cool. I scanned and captioned my stuff from wrestling and enjoyed one last (please God) horrible pizza and topped it off with cherry yogurt and a Fanta. Rode the bus over with Robert Hanashiro and talked about how this Olympics compared to the gillion other ones he has covered. He, as well as several other people I've run into or from email I've received have asked - "well are you having fun?" Fun: eating candy, roller coaster rides, skiing, etc. - or defined by Merriam-Webster: what provides amusement or enjoyment. hmmm, fun, that's kinda funny word to apply to this whole experience. Pretty much every time I'm photographing an event, yes I'm having fun, as long as I can turn to my right or left without touching some sweaty photographer. The rest of it I could do without - bus rides, bad food, but I've gone over this ad nauseam in the past blogs. But that, Hanashiro laments is the Olympics in a nutshell - dealing with all the crap with the payoff being able to witness the greatest (in the opinion of many) sporting events and athletes the world has to offer. The overall consensus from several photographers seems to be that Atlanta was the worst to cover and Sydney the best - Greece falls right in the middle - could have been worse, could have been better. I wasn't assigned to do boxing but because Ward is a local it was a big story for us and I wanted to squeeze it in before my evening assignment. I'm no Jed Jacobsohn or Jeff Chiu as far as boxing photography skills and our only option was to photograph from above, but I think I might be getting the hang of boxing - at least a little bit. I was surprised to see that the venue actually had fewer people in the stands than the prelims. I guess when there are a ton of matches family and friends show up - but when there are only six matches then fewer people show up. But I still thought that there would be a big walk-up crowd. I had less than 30 minutes before I had to leave after the boxing match (and it's good I did leave when I did - which you'll understand in a second). If we hadn't had the high speed line then I wouldn't have been able to transmit my stuff. But I scanned, edited and captioned stuff as fast as I ever have and turned out 11 images in about 20 minutes. Then bolted to Panathinaiko Stadium for the Men's Marathon finals. I think I caught the last bus going into the stadium. As we were driving in they were starting to block off streets. I got to the stadium about two hours beforehand and went immediately to the photo positions. I was borderline on-time to get a good position. I was there to cover the finish-line. They wanted the winner (obviously), the only Greek runner, and the very last runner - I guess someone was doing a story about the last finisher. Nhat's position for the Men's Marathon at the Panathinaiko Stadium for the 2004 Olympic Games on Sunday, August 29, 2004. Covering the marathon was probably the easiest thing to do, photographically, cause you knew exactly where the runners would be doing there thing - there wasn't really any room to move around either. So I just stood there surrounded by foreign photographers, European, Japanese, Chinese, Korean and photographed the winners and the other people coming in. I stood next to a nice Frenchmen who let me squeeze in next to him. It was really a great way to end the Olympics - seeing the marathoners head into the stadium was quite inspirational. I was somewhat surprised at how full the stadium was too, about 3/4ths full. They had a couple big screen TV's so everyone could watch the marathon. The crowd gasped as the weirdo came out and attacked the Brazilian who was leading at the time. For some reason I thought it was darker than it really was and I over-exposed my stuff by 3/4th's of a stop. But they were salvageable. I had to go back to the MPC because they only had about 40 phone lines available and they were all taken by the time I got there. So I got on a packed bus right after the last runner had come through the stadium. George Bridges and Harry Walker, two of the picture editors were there, so we chatted a bit and said goodbye when I left. What's the best way to finish a 15 hour work day? That's right - walk 2 miles with 20-30 pounds of gear! Because it was closing ceremonies tonight they decided to suspend the bus service. I had just finished scanning and walked out only to find that I'd have to wait an hour to an hour and half to catch the bus. I wanted to photograph the stadium from outside our media village when the fireworks went off because we have a pretty good view from there. The volunteer guy said just walk up the street and catch a cab. So I walked up there only to find out that the road had been closed. So I just decided to keep walking. Maybe I was inspired too much by the marathoners and felt that if they could run 26 miles in 2 hours and 10 minutes then I should be able to walk 2 miles with my gear. According to the schedule the ceremony was supposed to end around 11:30-12:00. I got back at about 11:05 (saved 30-45 minutes of my life by walking), but unfortunately they had their main fireworks show at about 10:45... So I missed photographing it. Oh well. I wasn't too broked up over it as we had plenty of great photographers covering it. Italy's Stefano Baldini celebrates his win for the Men's Marathon at the Panathinaiko Stadium for the 2004 Olympic Games on Sunday, August 29, 2004. Got up early this morning and started packing. It's amazing how much crap I have. I shipped a box of souvenirs and stuff back to my parents but I still seem to have a ton of stuff. Got the majority of it packed in time to make the 10 minute walk downhill to the Irini Metro station at 1 p.m. with Ron Cortes so that we could go out for lunch. The walk down the hill is pretty nice we have a nice view of the Olympic Stadium. The Metro is free for those who have Olympic media credentials, it's only .70 Euro downtown anyways. We met Julian Gonzalez, Al Diaz, Dave Eulitt, Joe Rossi, George Bridges, Alan Greth, Karl Mondon and Bruce Chambers at Syntagma Square. From there we wandered around and settled on some swanky, overpriced restaurant. Service was very slow, food okay, 2 1/2 hours later we said goodbye and Ron and I walked around different shops. Our 10 minute walk back from the Irini station wasn't too bad and the weather was surprisingly mild. Now I'm getting ready to head to the airport - my plane leaves at 6:45 a.m. tomorrow morning. They have an airport shuttle running every hour. I'll probably catch the 1 a.m. or 2 a.m. shuttle. It's about an 30-45 minutes to get out to the airport but I have so much crap to move around I'd rather get out there early. 30 assignments, 18 different sports, 20 different venues, in 16 days. But that is a little bit misleading, for example, I count Shot Put as one assignment - but that took 26 solid hours, 9 hour bus ride (round trip), two qualifying rounds, two finals, scan and transmit time. Just to put the number of different sports into perspective - there were 37 different sports/venues to go to. Most sports I photographed once or twice. I photographed track & field and boxing three times each. Sometimes I did do just one assignment a day and I was given a half day off - this was usually scheduled after a very long day or in preparation for a very long day. No idea. An easy day was 10-12 hours. A medium day was 13-16 hours. A tough day was 16+ hours. And like I said above - longest day 26 hours. With digital we don't really count rolls anymore, but I did shoot 65 gigabytes worth of space. Which is a little misleading because I like to delete a lot of images on the camera when I'm out shooting. I averaged about 2-4 gigs per assignment. Example, one day of Track & Field I shot 2.27 gigs. That's about 900 frames (each file about 2.4 megs). The least I shot on an assignment - 120 megs for the portrait of the diver. The most, boxing 5 gigs!!! But that includes a remote camera and 15 different matches. That is tough - I think I got my best action pictures at wrestling, I enjoyed the experience of Olympia as a whole (photographing it wasn't very fun), softball and tennis were both all-around fun to photograph because of the light and lack of photographers. I enjoyed photographing track & field the least because of the shooting positions and the amount of photographers there. Seeing people I have met win a bronze medal was great - synchronized swimmers. 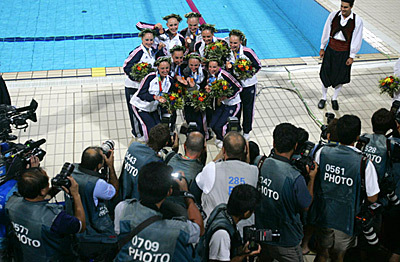 The USA synchronized swim team poses for a picture following the medal ceremony for the Synchronized Swimming Team Event - free routine at the Olympic Aquatic Centre for the 2004 Olympic Games on Friday, August 27, 2004. USA won bronze. My PacSafe $99 bag from R.E.I. which allowed me to lock up cameras or my computer when I went to get a bite to eat when I was at a venue. A Jessica recommended GameBay Advance SP - made the flight over here bearable. A fifth camera body. 24mm f1.4 lens. Rain gear (I heard it rained in Sydney). Well I figured instead of writing X amount of emails to my Mom and David and Nol and Jessica and Jeffery and Andy and Justin and Eric and Jan and Beth and Vicki and Bill and DBH and Juliette and so on I'd write one mass email - this blog. When I was at assignments I would often jot down a thought or an experience on the roster and then expand on it once I got back to the room. Well knowing what I know now IF I'm ever asked to go to an Olympics again the knowledge I have would certainly make life a lot easier. Well maybe not "a lot" but definitely somewhat easier. I wouldn't have brought as much stuff. I would have packed differently. Each venue, each sport had it's own little quarks. I found out in the last several days from Rocky Mountain News' Joe Mahoney that we could email the photo manager ahead of time about questions and so forth - where we got the email list I have no idea. And, like he said, when did I have time to do that? But I would definitely consider it. Who knows, in the end it's not really for me to decide. All in all every day was a new adventure. Many days I went to a new venue and had to figure out the rules of the venue, the rules of the sport, what lens to use, where to put up remotes (if possible) and where to transmit. The majority of the sports here are sports that we in America never get to cover. My sports coverage consists of football, basketball and baseball. Every once in awhile I'll photograph soccer or hockey. And for the most part that is it. So it was challenging to figure out what the heck is going on in field hockey or where's the best angle for badminton or what kind of lens am I going to need for kayaking. Talking and meeting other photographers and learning from their experiences was great too. We had really good, open communication on our "team" of photographers. If I was going to go to beach volleyball and I knew Dave Eulitt had been their the day before I'd give him a call and get the lowdown - what lens, what shooting positions, where to transmit, how early do I need to get there, how long will it take to get there, any good food there, etc. And vice-versa. That made life easier. I would hope every photographer who wants to is lucky enough to go to the Olympics at least once, it's a great learning experience, one that's hard to describe but very fulfilling and rewarding. Well I hope you've enjoyed this blog - it's really just my miscellaneous ramblings, a journal if you like, to family and friends, but it's good for me too because in a year or two - okay - in a day or two I'll have forgotten so many of the things that I wrote down that it will be great to reread them in a year or five and remember the different things that I did.